It’s now 12:27am because I thought I should stop and take a picture of the eat-in kitchen that is part of my studio hotel room where I am currently staying … but let’s not get ahead of ourselves. This last week I was in Chicago for the American Institute of Architects National Convention – I arrived around 1:00am Wednesday morning (my first seminar was 6 hours later) and I left Sunday at 9:00am to drive to northern Wisconsin to meet with some new clients. The convention, as always, was great. I get to head out-of-town, see some amazing architecture, spend time in the company of (mostly) like-minded individuals, meet some new people and spend time with old friends who I only seem to see during the national convention. I love it … but I kind of hate as well. After spending 4 days going wall to wall looking at projects completed by some of the most gifted architects in the world, I left feeling completely inadequate … do other people feel this way when they look at other people’s work? Do they take the measure of their own accomplishments and find them wanting like I do? Don’t get me wrong, I happen to think I’m pretty good at what I do, and the people I am comparing myself against are some of the best in history. But what’s wrong with comparing yourself to the best? I’ll get to the point of the post at the end but I thought I would show you some of the photos I took while in Chicago at the AIA National Convention. These are just some of the highlights and all were taken with my cellphone (I haven’t had time to download and look at the pictures I took on my camera just yet, it’s my hope that they are better than these.) 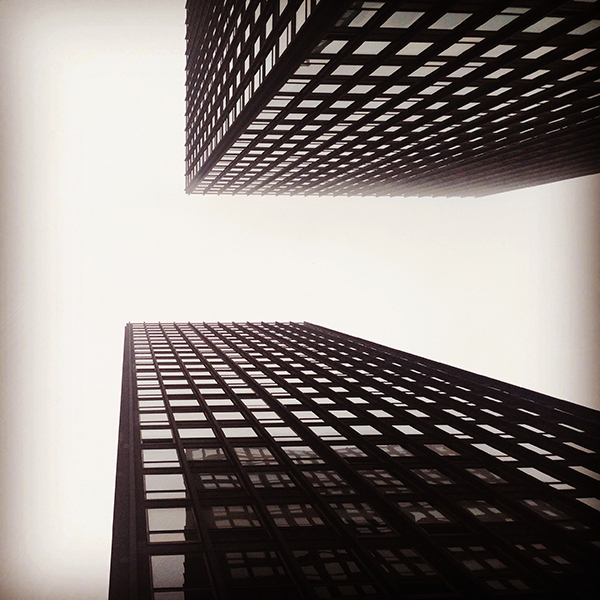 The picture above is 880 Lakeshore Drive by Mies van der Rohe. This is the ‘Farnsworth House’ also by Mies van der Rohe. It is a beautiful house to look at but I wouldn’t want to live there. There are all sorts of issues with how this house functions but who cares? I love this house. I ate terribly when I was in Chicago despite the fact that it is fairly renown as a foodie-town. Most of what I ate was buffet line chow at the various evening events I attended – blech. Nothing worse than eating 4,000 calories of food you can’t remember eating the second it leaves your plate. This is the Aqua Tower by Studio Gang. Interesting building to look at when standing fairly adjacent to the tower – you can really see how the individual floor plates change shapes to create the signature look on the facade. The thing that made the visit to this building enjoyable was that Jeanne Gang led the tour herself – she even signed my copy of her book at the end of the tour. Sweet. No trip to Chicago is complete without looking at some of the work by Frank Lloyd Wright. This is the Robie House and if you’ve never seen it in person, you need to add it to your bucket list. On Saturday, I spent the entire day looking at the work of Howard van Doren Shaw. This particular image is the McBirney House ‘House of the Four Winds’ and was built in 1908. It’s actually for sale at the time of this writing and can be yours for $4,995,000 – pretty reasonable if you ask me. It was a truly beautiful house but if you are familiar with the Arts and Crafts work of van Doren Shaw’s work, you already know this. Saturday night I convinced a handful of people to go up into the Hancock Tower so that I could look out over the city – totally worth the hour in line we had to endure to ride the fastest elevators in North America. Quite a view isn’t it? I spent almost all of last week looking at the projects of historically notable architects and while I can enjoy myself by looking at architectural masterpieces, I would be lying if I didn’t confess that I left thinking that I need to step my game up. We are moving out of our current offices and into a new workspace that is currently under construction. I am presenting in Illinois at a leadership conference August 1st, and I need to get my material prepared. I have been asked to talk about leading professionally, due in no small part to the articles I write here on this blog. I have two projects under construction, a third about to start, two projects entering into schematic design – neither of which are in town and a large project entering into design development … also out of town. I am going on vacation to Seaside, and I’ll be taking my nieces and nephews with me. There will be enough people that we have to take two cars to fit everyone but I know that this will be a highlight of my summer. I have three playhouses that will start construction and be delivered for charity. One is of my own design, but I will be responsible for overseeing the construction of all of them. Rather than spending time focusing on all the things you aren’t doing, use that time to say “yes” more often.